In a subtle yet stylish pattern, our printed dress shirts are ready to take anything in your closet up a notch. We cut and sew our shirts to exacting standards and finish them with all details you've come to expect: a wide spread collar, removable collar stays, reinforced buttons and seams, and double-button barrel cuffs. A truly versatile pattern, this shirt handles everything from your mid week work rotation to your weekend casual. Is your size out of stock? Let us notify you when we restock. What is your fit preference? 5' 4" 5' 5" 5' 6" 5' 7" 5' 8" 5' 9" 5' 10" 5' 11" 6' 0" 6' 1" 6' 2" 6' 3" 6' 4" 6' 5" 6' 6"
What is your neck size? What size jeans do you wear? 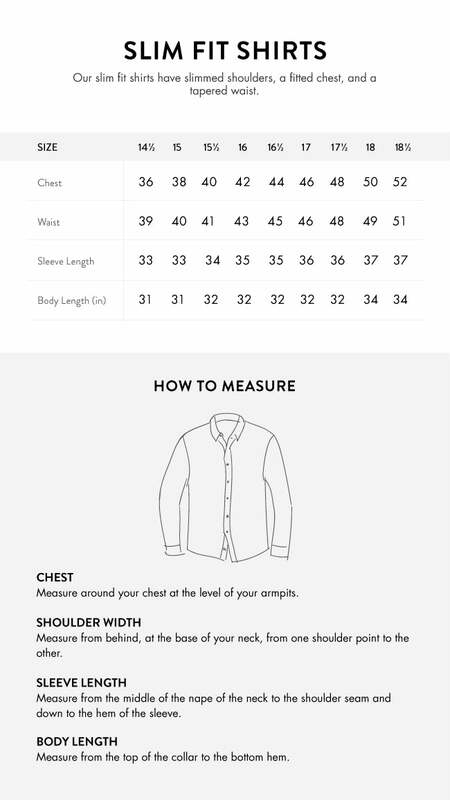 Based on the data you entered, we recommend the following suit jacket size. You may still want to take your suit to a tailor for additional alterations.